Our simple electric heater room calculator will provide you with an estimate of the minimum size and quantity of radiators, panel heaters or storage heaters your room will require to establish and maintain a temperature of 21°C within the United Kingdom. Or call one of our advisors on 01473 276686 for a more accurate heat loss calculation. Enter the dimensions of your room in meters. Select a thermal zone from the map. Is any of the room exterior facing to the North? 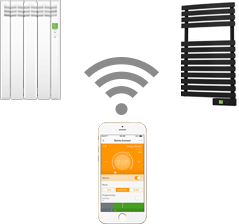 The Rointe Delta has a built-in Wi-Fi module, enabling complete management of your heating from anywhere. Using Rointe's e-Life technology, the Rointe Delta range can be directly controlled at anytime, wherever you are, using a smartphone, tablet or computer. The entire range of Rointe Kyros products can be programmed using the Infrared Remote Control system. 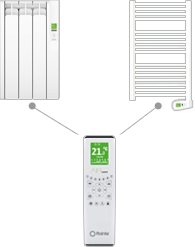 It allows you to create and configure your programmes within the remote control and send the configurations to all of your installed radiators, towel rails and water boilers. Heater Shop specialise in supplying premium and budget electric heaters and electric heating solutions, including high efficiency Elnur, Haverland & Rointe electric radiators and electric towel rails. 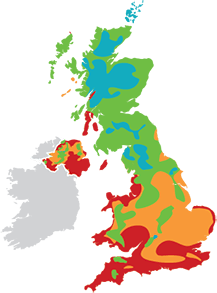 As standard we offer free next day delivery to most of England, Scotland & Wales, free design service including accurate heat loss calculations and a price match policy - we won't be beaten on price. Call now on 01473 276686. **Competition update** Winners to be announced shortly!